An estimated 25% of factory and warehouse accidents occur in and around the loading bay. High levels of personnel and mechanical traffic, often combined with a low appreciation of the risks involved, mean that loading bays can, potentially, be extremely hazardous places in which to work. The British Safety Council has warned that in the current business climate there is a danger that firms will cut back on health and safety planning and implementation. This is a short-sighted approach as it could lead to potential equipment failure, together with a possible increase in personal injuries at work. 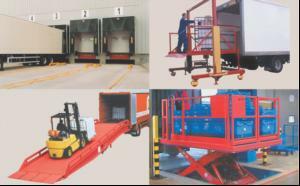 There are a number of statutory obligations where it is a legal requirement for loading bay and load handling equipment, including industrial doors, mobile yard ramps, dock levellers, lifting platforms and scissor lifts, to be subject to Thorough Examination inspections, in conjunction with regular service and maintenance programmes. These include the Health & Safety at Work Act; the Provision & Use of Work Equipment Regulations (PUWER); Lifting Operations & Lifting Equipment Regulations (LOLER) and the Machinery Directive. In general terms the PUWER regulations, which cover the use of mobile loading ramps, require that equipment provided for use at work is: Suitable for the intended use Safe for use, maintained in a safe condition and, in certain circumstances, inspected to ensure this remains the case Used only by people who have received adequate information, instruction and training Accompanied by suitable safety measures, eg protective devices, markings and warnings The new Machinery Directive has been introduced with the aim of reducing the number of accidents relating to machinery use by setting much stricter safety standards. There are also additional recommendations from the Federation Europeene de la Manutention (FEM) - the European Materials Handling Federation - under their Periodic Inspection of Lifting Tables and Dock Levellers guidelines (see www.femeur. However, making sure your loading bay area is safe is not just about meeting the correct regulations. It shows that as a responsible employer, you take health and safety issues seriously and are concerned about the well-being of your employees. If you fail to meet the appropriate regulations and do not service and maintain your load handling equipment properly, it can result in a fine and, if an employee is injured in an accident due to equipment not being maintained properly, it might also mean you could be faced with an expensive personal injury claim, as well as possibly invalidating any manufacturer warranties. Badly maintained equipment can also lead to expensive downtime. Buying equipment from a reputable supplier and implementing a regular inspection and maintenance schedule as part of a pre-planned service contract is a costeffective way of avoiding such problems, while also extending machinery working life. It's crucial that all your loading bay equipment bears the CE mark. This is the manufacturer's confirmation that it meets all the essential health and safety requirements of the Machinery Directive. To meet the PUWER and LOLER requirements, checks have to be carried out by a 'competent person'. Thorworld service and maintenance contracts are available for all relevant equipment provided by us; this delivers compliance with all the relevant regulations and ensures the correct operation of the equipment to maintain the efficiency of your business operations. As part of a Thorworld pre-planned service and maintenance agreement, our team of dedicated service engineers will inspect and maintain all of the equipment we supply and, additionally, can advise on (and undertake) any essential repairs. Under the terms of our service contract we carry out regular annual inspections - although some customers prefer a six month check; it depends on the type of equipment and level of use.Where required, on-site staff training can also be carried out, with competency certificates issued as appropriate. The message is clear: Spending a relatively small amount each year on a pre-planned service and maintenance agreement is a valuable long-term investment. It will save money, increase personnel safety, ensure you keep within the law and, at the same time, extend the working life of your equipment by keeping it in a tip-top safe and efficient working condition - providing extra peace of mind for all concerned.